Van Vicker in the studios of Citi FM with Jessica Opare Saforo Although it is very obvious that Actor Van Vicker, who started his career in showbiz in Ghana, appears to have found solace in the oil rich state of Nigeria where he has become a star actor, he has told Citi FM’s Jessica Opare Saforo that he has not moved to Nollywood. Back home in Ghana, movie lovers and producers have criticized the gentle and fresh-looking actor for neglecting the growing Ghana movie industry for Nollywood where the industry is bigger and pays well. Others have also lauded him and urged him to fly high the flag of Ghana. In an exclusive interview with Citi FM where he co-hosted “Host of Brunch In The Citi” with Jessica Opare Saforo, Van Vicker said he is seen to be acting more in Nigeria because the demands of the job take him there a lot. “I haven’t moved to Nollywood. It is just that I happen to do a lot of my jobs there. It’s a little complicated managing my time between Ghana and Nigeria and Europe. I know 2011 is a different story. I am joining the producers Association in Ghana and I will be speaking to them. In 2011, I will act more Ghanaian movies. It is not as if I am not acting in Ghana because I don’t want it” he explained. Joseph Fiifi Van Vicker noted that he is not in Nigeria because of the financial gains although he admits that the market there is bigger. The fair-skinned Actor who is often compared to Nigerian Ramsey Nouah and fellow Ghanaian actor Majid Michel, denied suggestions that his chances in Ghana have been blocked by Majid Michel hence his decision to act in Nigeria. Vicker was born to a Liberian mother and a Dutch father but has a Ghanaian background. The ‘Romantic Male Actor’ is married to Adjoa Van Vicker and they have two lovely daughters. 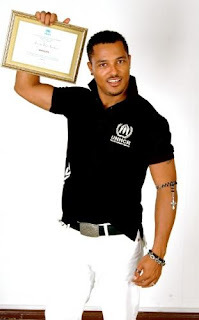 He founded and runs the Van Vicker Foundation, an outreach program for upcoming young artists.